Having learned that Oliver is being hidden away, Felicity begins investigating Level 2 of The Slab, with a little help from Black Siren and Dinah Drake. Meanwhile, Digg asks Curtis to go undercover for an ARGUS mission, as Oliver finds The Demon on Level 2 of The Slab. How exactly is the PR nightmare at The Slab supposed to free Oliver? Oliver pled guilty to the charges against him and the corruption at the prison has no baring on his trial or sentence. Lexa Doig and Stephen Amell both give power-house performances here and have tremendous chemistry together. Great action sequence in the hallway to the morgue as Talia and Ollie escape. Talia says that she was locked up in The Slab after a run in with an old foe in Gotham City. This is almost certainly a reference to Batman and proof that he exists on Earth One in the Arrowverse. The RFID tracker that Felicity planted on The Silencer's belt is linked to her facial recognition program, which is run through every CCTV and traffic camera within five miles of The Silencer's location. The shock bracelets Level 2 inmates are required to wear have anti-tampering alarms. Ollie: You expect me to help you? After all the pain and suffering that you inflicted on my family?! Talia: What does it tell you that I would even ask for your help after what you've done to mine? Talia: These people are criminals. The likes of which you've spent the last six years putting away. I'm surprised you want to help them. Oliver: But you were the one who pushed me towards helping others. Towards fighting for justice! You had honor then! Talia: That was a long time ago. Felicity: I thought that the worst thing that could happen was me losing my husband to prison. Well, what if I lose him permanently? Dr. Parker: I suggest you hold very still 4587. Ollie: My name... is Oliver Queen! Talia: If you stay, you will die. Ollie: If I leave, I'm a fugitive forever. I won't do that to my family. (pauses) All those years ago, you were wrong. Giving the monster an identity didn't contain the darkness. It just gave it power. Separating into two selves? Hiding in the shadows? That was never the answer. Talia: I will make sure your wife gets this. And that she knows that her husband is as stubborn as ever. Oliver is now ready for Phase 2 of being a Level 2 inmate. This involves being fitted with an electronic bracelet that administers electric shocks and being placed in the charge of a specific guard. Oliver identifies the inmate who previously attacked him and told him his wife and son were dead as one of the inmates on Level 2. Inmates on Level 2 are not allowed visitation. ARGUS Deputy Director Bell is diabetic. Malcolm Byrd is a black market arms dealer who specializes in chemical weapons. Dr. Nyambi Somto is a biochemist who disappeared with a number of nerve agents banned by The Geneva Condition. Curtis has 14 PhDs, including one in biochemical engineering. Curtis can speak six languages. Two of them are English and French. After the inmate who threatened him before shoves Oliver, he is taken away behind the blue door that most of the inmates seem afraid of. Oliver is attacked in his cell at night. His attacker is Talia Al Ghul, last seen in 523. Talia says that she was locked up in The Slab after an encounter with an old foe in Gotham. Talia says she only survived Lian Yu thanks to a drug that Diaz developed and that she planned the attack on Oliver in exchange for his help. Talia says there is a way to escape from Slabside but she needs Oliver's help. He refuses to give it. Curtis is terrified of doing field work in the wake of Oliver going to jail. Stanley tells Felicity that Oliver has been sent to Level 2 of The Slab. Felicity determines that Level 2 is completely off the books. The inmate who attacked Oliver is wheeled out of the other room with the blue door, apparently dead. Talia says that the ones Dr. Parker kills are the lucky ones. 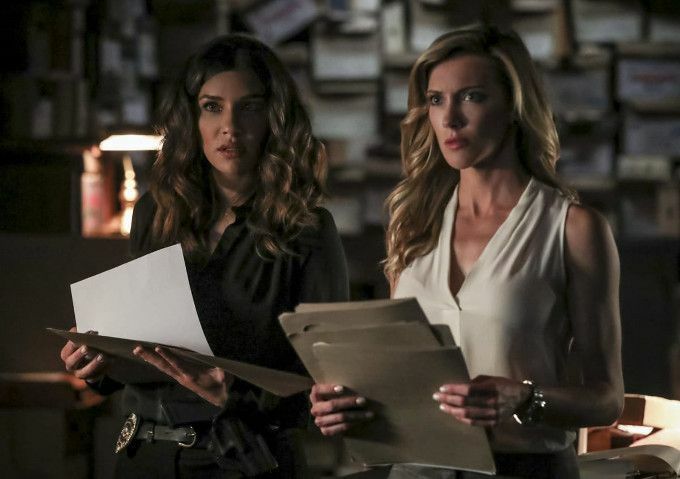 Felicity asks Dinah to go through the hard copies of the SCPD files to see if there were any complaints filed against Dr. Parker. Felicity determined that Slabside does not have a psychiatric treatment program. Curtis is able to bring down Byrd and his men with the help of his special brief-case and the hidden targeting drone inside of it. Talia and Ollie stage a fight, resulting in them both being sent behind the blue door. Dr. Parker was a defendant in three malpractices cases that were all settled out of court. One of Dr. Parker's patients was a violent teenager named Robert Goodman. Dr. Parker promised his parents he could make their son docile. Instead, his treatment left Robert with sporadic bouts of amnesia. Eventually, he lost all sense of self completely. Robert Goodman was one of nine similar cases leveled against Dr. Parker. The Slab disposes of dead bodies on Level 2 through a dumbwaiter that leads to the water under the island. Talia uses this to escape. Oliver refuses to escape from The Slab, saying that he won't live as a fugitive. Talia delivers the flash drive of Dr. Parker's files to Felicity anonymously. Oliver is sent back to Level 1 of The Slab, with Dr. Parker's program and Level 2 having been shut down after being exposed to the public. Black Siren says they can use The Slab's current PR nightmare to overturn Oliver's conviction. Curtis finds an encrypted image among Byrds files. He determines that it is a painting by a 19th century French artist named Jean-Leon Gerome, titled Dante He Has Seen Hell. Stanley tells Oliver that Felicity said she had a lead on Diaz and was close to getting him. Felicity's tracker locates The Silencer in Moscow. The episode ends as The Silencer arrives to find Diaz beating up Anatoly. Decent enough as a filler episode, if you ignore that it makes Oliver's trip to Level 2 largely pointless in the grand sceheme and that Dinah, Felicity and Black Siren really don't accomplish anything. The Curtis/Diggle storyline is amusing enough and its nice to see Curtis not being treated purely as comic relief for a change. Still, none of these stories are as engaging as the future flash-forwards or the mystery of the new Green Arrow.